In FUNtabulousFriday – Colours Part II, I decided to focus on one colour at a time. I am not really sure if he already knows the colour well. There are times that while playing, I would purposefully ask for a red ball, a blue circle or a yellow square. On quite a few occasions, Umar Khalif picked out the correct item for me. However, there were also times when he will look at me doe-eyed and then continue with his play. Of course, at only 16 months, it seems a little kiasu of me to test him but sometimes I cannot help it. 🙁 I must always remind myself that learning should not be stressful for both him and me. On the first week, we started our very first sensory bin with all the red items we could find around the house. It includes red water-beads, leftovers cut-outs from red foam papers, red rice, red poms poms and last but not least, red wooden tiles. 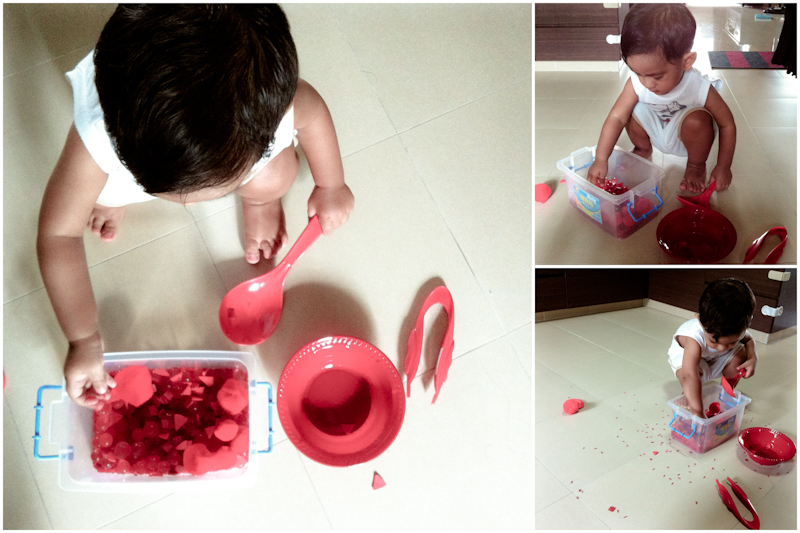 With a red sadle, red tweezers and a red bowl, he had a great time scooping while discovering that the water beads can slide and bounce like a ball. As I did not throw any of the contents of the sensory bin (it would be such a waste!!! ), I decided to do a follow-up lesson the following week. 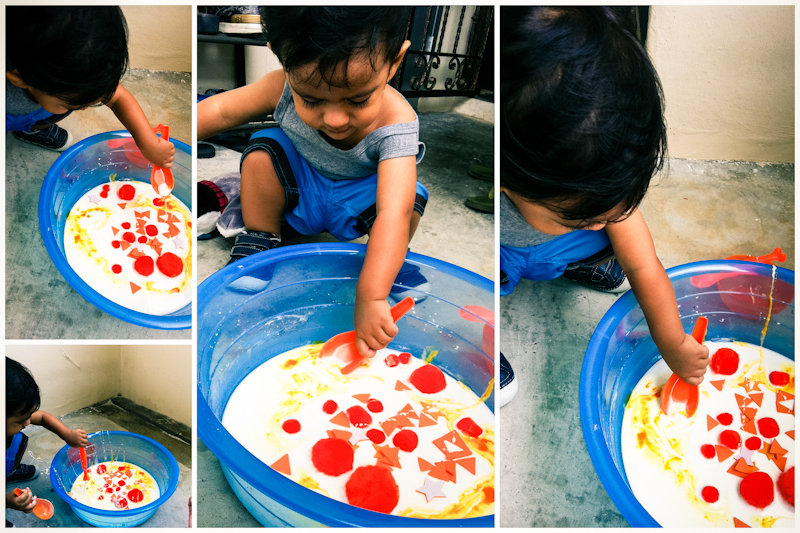 With the contents from the sensory bin sans the water beads^ (as I needed the contents to be dry), I let Umar Khalif do some pasting activities. I pasted red ice-cream sticks on a piece of white paper to form a triangle and a square. 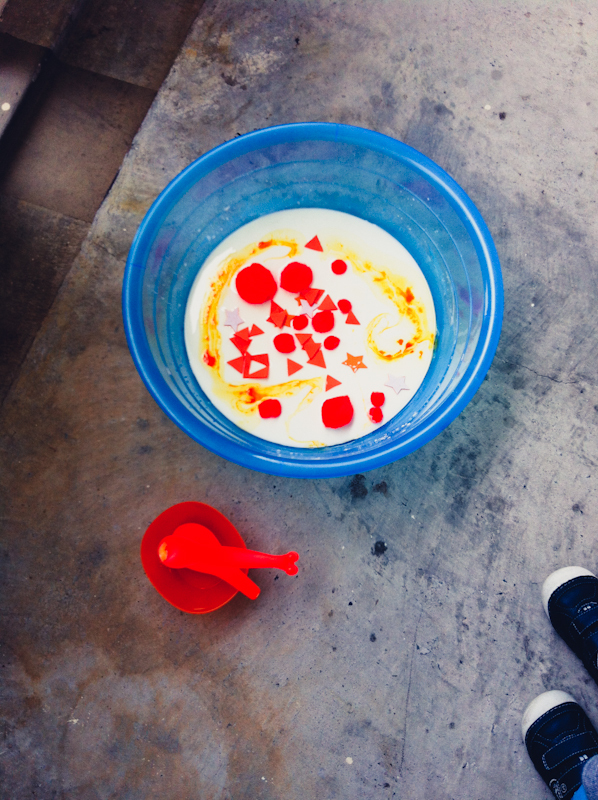 With a little guidance, Umar Khalif smeared glue using a brush in the space confined by the ice-cream sticks. 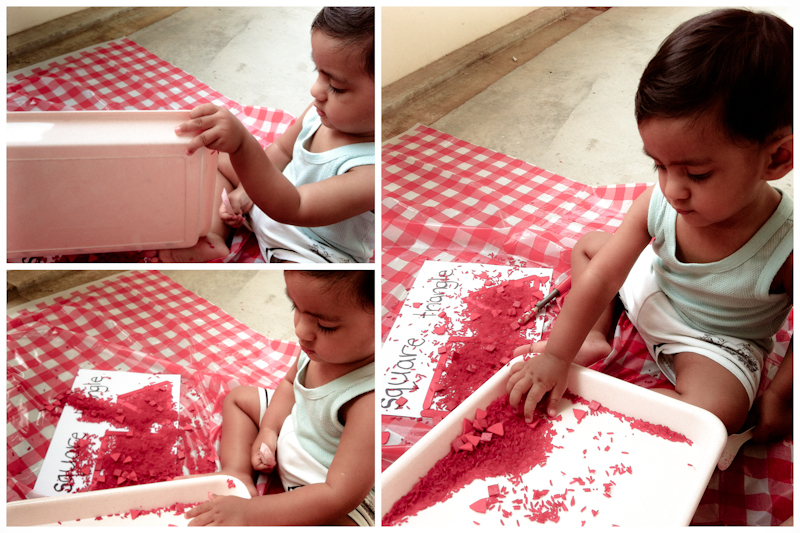 Then, he sprinkled the contents of the earlier sensory play on the paper. Next up was the colour blue. 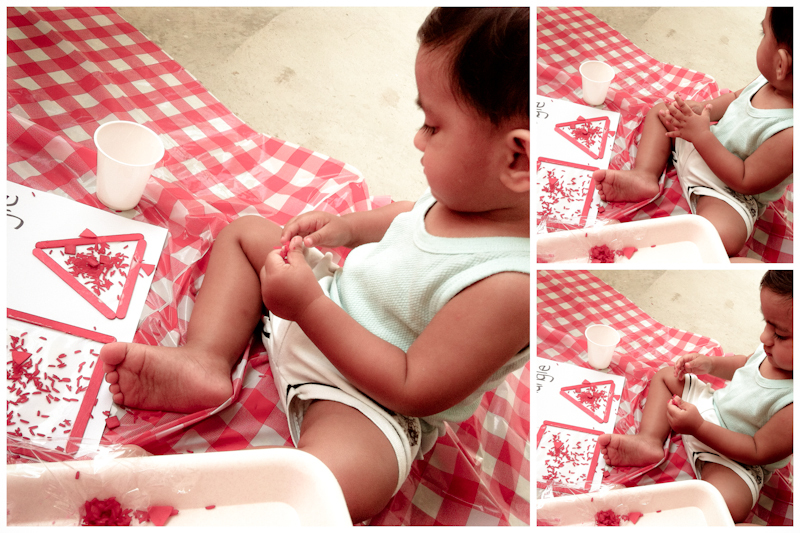 I decided to do a stamping activity using fingerpaint. It did not excite him as much because it involves PAINT! He did only a few stampings and called it a day. So, I decided to do another sensory bin for yellow. It contained cut-outs from H&M plastic bag, yellow strings, yellow poms-poms and yellow wooden tiles. It is pretty much similar to the one I did for the red activity. I had two yellow ice-cream sticks pasted and two yellow circles drawn on top of the ice-cream sticks. He is to sprinkle the yellow knick-knacks from the sensory bin over the circle which already has lots of glue on it. They make different interesting sounds each time Umar Khalif give them a punch. Each balloon was filled with a different item – water, sand, expired dhal and air. At first, he was quite apprehensive even to be near the balloons. Soon after, it became his favourite “rest point” in between his play. We had the balloons for two weeks. One morning, when he realized that the balloons were no longer there, he actually went around looking for it. *oobleck/goop is a mixture of cornstarch and water. More info here. There are some who mentioned that oobleck or goop are two different things. Maybe someone could share information about these two?